- fixed Vista (possible Windows 7) bug with not being able to type in the batch dialog some characters used as shortcuts (R, L, etc). This occurs only if the program is launched with at least 2 files as parameters which results in the Batch window being opened at startup. - fixed an access violation at startup in the DLL version, which occurs only in Vista (possible Windows 7). The exception is caught when reading the configuration data. behavior was to show the window with no files loaded. * fixed a bug with Paste from clipboard. Pasted images were shifted a few pixels. * fixed a bug in the DLL version with the toolbar containing rotate, resize, compress to size, etc. The toolbar should be enabled after successful image loading from the host application. * DLL version: the default chroma for RIOT_SaveToFile is now "medium" instead of "low"
* Batch mode: fixed a bug when using a bat file as external PNG optimizer and @echo off is not on the first line. This problem does not occur in normal mode. is -100% or ~ -99.9%. Fixed !
! using checkerboard to show transparency instead of background color from file. Some images have the background the same color as the foreground and that can be confusing. 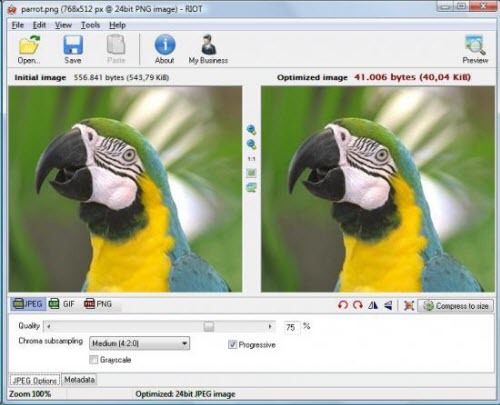 ..- OptiPNG v0.7.6 (версия от 03.04.2016) вместе со справкой (EN). ..- PNGOUT (версия от 20.02.2013) вместе со справкой (EN). ..- AdvanceCOMP v1.20 (версия от 14.08.2015) вместе со справкой (EN). ..- TruePNG v0.6.2.2 (версия от 03.04.2016) вместе со справкой (EN). ..- PNGCrush v1.8.10 (версия от 29.10.2016) вместе со справкой (EN).